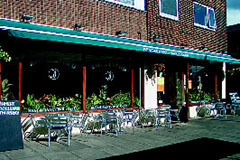 This recently opened, fully renovated, modern style restaurant/bar with a lively atmosphere is the ideal place to enjoy simply a drink with friends, a cocktail from the wide selection, a hearty meal from the very attractively priced menu with daily specials board or traditional family Sunday roast lunch. Bright and airy with a large bar area, this must be the perfect meeting place or party venue where you are assured of a warm welcome and very friendly service. Live music every Thursday evening. Open Mon-Sat 12-3pm and 6pm-midnight, Sun all day. All major credit cards accepted (not Amex/Diners). 10% service charge on parties of 5 and over. A la carte menu with vegetarian options and a selection of daily special dishes. Traditional Sunday roast.